More seat polls, more indications that the Nationals in particular have a battle on their hands. NOTE: The main discussion thread is the post beneath this one, dealing with the 54-46 federal Newspoll result. The Daily Telegraph has another two YouGov Galaxy seat polls today, from Lismore and Barwon, that conform with an emerging narrative of trouble for the Nationals. The report does not say when the polls were conducted, but the sample sizes were 588 in Lismore and 502 in Barwon. • The headline from Lismore is that Labor leads 51-49, but this is based on a respondent-allocated preference flow that is much better for the Nationals than they enjoyed in 2015. This can be gleaned from the fact that the Nationals primary vote is at 35%, compared with 42.5% in 2015, whereas Labor (28%, compared with 26.4%) and the Greens (27%, compared with 25.6%) are little changed. Broadly speaking, this suggests a repeat of 2015, when the Greens narrowly outpolled Labor to take second place. This runs against the general sentiment, which says the Greens are unlikely to repeat their coup in winning Ballina and coming close in Lismore, as the issue of coal seam gas extraction has lost its currency. The Nationals member, Thomas George, who is now retiring, finished 2.9% clear of the Greens at the final count in 2015, but a Nationals-versus-Labor preference count found this would only have been 0.2% if Labor had emerged second. The table below shows the relevant details from the Nationals-versus-Greens and Nationals-versus-Labor preference counts in 2015. 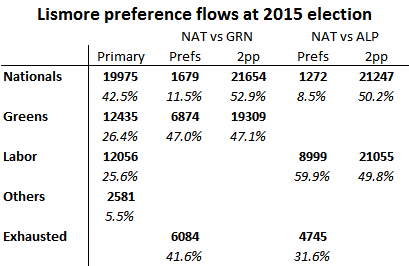 If these preference flows are applied to the poll results, the Greens emerge with a 53.6-46.4 in a Nationals-versus-Greens count, while a Nationals-versus-Labor count blows the margin out to 56.6-43.4. • In Barwon, where Kevin Humphries is retiring and the water management is biting as an issue, the Nationals are credited with a lead of just 51-49 over Shooters Fishers and Farmers. Nationals candidate Andrew Schier is on 40%, down from Humphries’ 49.1% in 2015, while Shooters candidate Roy Butler is on 30% – beyond that, we are told only that Labor and the Greens are down, from 24.0% and 6.2% respectively. In this case, the respondent-allocated two-party result looks about right. • A report by Deborah Snow in the Sydney Morning Herald adds Myall Lakes, a Mid North Coast seat with a margin of 8.7%, as another addition to the seats along the state’s northern coast where Labor fancy themselves a chance of unseating the Nationals. Other examples were canvassed in this blog post, and in my article from Crikey (paywalled) on Friday. • A dust-up played out last week in the seat of Port Stephens, which the Liberals harbour hopes of gaining from Labor, after Facebook suspended fake accounts that had been used to post comments critical of Labor member Kate Washington. The Liberals accuse Washington of misusing the electoral roll in her efforts to ascertain the Facebook posters’ identities, and have lodged a complaint to that effect with the Electoral Commission. They insist candidate Jaimie Abbott’s hands are clean in the matter, and that the blame lies with a volunteer on her campaign, Tasman Brown, who is also a staffer to upper house MP Catherine Cusack. Abbott’s own Facebook account was also been suspended, but this may have been collateral damage arising from Brown’s administrator privileges over the account. • The Sydney Morning Herald continues to drip out results from its uComms/ReachTEL poll, today reporting that “the economic outlook, including falling house prices” had 35% saying they were more likely to vote Coalition, 40% less likely and 24% no difference. A fairly robust second week of the New South Wales makes no impression on the latest poll result, which also finds public opinion leaning strongly to Labor over the stadiums issue. NOTE: The main discussion thread has fallen down the page a little, to here. That will be rectified when, presumably, Newspoll comes through this evening. Today’s Sun-Herald has the first statewide poll of the New South Wales election campaign, conducted on Thursday by uComms/ReachTEL from a sample of 1019. The results are remarkably similar to the last such poll in late November, weeks after Michael Daley assumed the Labor leadership: two-party preferred is unchanged at 51-49 in favour of Labor, while the primary votes, after exclusion of the undecided (4.7% this time, 3.1% in November) are Coalition 37.5% (down 0.2%), Labor 35.8% (up 0.6%), Greens 10.1% (up 0.2%), One Nation 5.9% (down 1.8%) and Shooters Fishers and Farmers 4.8% (up 1.4%). The two-party preferred result is presumably from respondent-allocated preferences, but the result from 2015 election flows would be the same. Michael Daley retains his lead over Gladys Berejiklian, which is 53.3-46.7 in this poll, and was 54.2-45.8 in the November poll – surprising results both, although ReachTEL’s forced response preferred leader polls consistently produce unusual results. The poll also shows 52% opposed to the government’s expansive spending plans for Sydney sports stadiums, with 37% in support. The new poll numbers make next to no difference to my state election poll tracker, the current reading of which is almost exactly the same as the uComms/ReachTEL result. You can view the trend charts over the fold, with a little more value added in the display on my election guide. Ballot paper draws bring bad news for One Nation and the Liberal Democrats – but very good news for Shooters Fishers and Farmers, who are reportedly giving the Nationals quite a bit to think about. • Nominations closed on Wednesday and the ballot paper draws were conducted yesterday. Only the Coalition, Labor and the Greens are contesting every lower house seat – the most prodigious of the micro-parties are Sustainable Australia (55 lower house candidates), Animal Justice (48) and Keep Sydney Open (42). One Nation are only contesting 12 seats in the lower house, and have drawn the last column out of 20 on the Legislative Council ticket. The Liberal Democrats have not sustained their usual good luck on this score, scoring the fifteenth column, to the right of Liberal/Nationals in the eleventh column, reducing their prospects of scoring votes from confused Coalition supporters. The lead One Nation and Liberal Democrats candidates are, respectively, Mark Latham and David Leyonhjelm. I will update my election guide over the weekend to include full candidate lists, and add a few more bios and candidate pics where appropriate. • The big winner from the upper house draw is Shooters Fishers and Farmers, who have the first column – which, by the assessment of Andrew Clennell in The Australian, means they are “in good shape to win a third upper house seat”. The report also relates that internal polling – it does not say whose – has the party looking competitive in the Nationals-held seats of Barwon and Murray, with their primary vote in the high twenties and the Nationals in the low thirties. A report in the Daily Telegraph yesterday spoke of polling showing the Nationals primary vote on 35% in Barwon, down from 49.1% in 2015. • My election guide now features betting odds for each electorate from Ladbrokes, with the curious exception of Blacktown, on which they aren’t taking bets for some reason (probably administrative oversight). Whereas Ladbrokes is offering $1.87 on both the Coalition and Labor to win the election (see the sidebar for the regularly updated odds), the seat markets favour the Coalition, with the Coalition favourites in 49, Labor in 38 and others six (i.e. all the incumbents and no more). Labor are favourites to gain the Coalition-held seats of Coogee, East Hills, Tweed and Upper Hunter. Mixed messages from two YouGov Galaxy seat polls, and also apparently from party internal polling. The campaign for the New South Wales state election will officially kick off today with the issuing of the writs, which under the state’s fixed terms architecture occurs in unusually close proximity to election day itself. Nominations close on Wednesday, with ballot paper draws to follow on Thursday; early voting opens next Monday; and the big day itself is March 23, less than three weeks away. Do take note of the Poll Bludger election guide, to which a link can be found on the sidebar. • An encouraging result for the Liberals in East Hills, where the Liberals got over the line by 0.6% in the 2011 landslide, then did very well to retain it by 0.4% in 2015. The poll result points to another squeaker, with Liberal and Labor tied on two-party preferred, from primary votes of Liberal 44% (44.2% in 2015), Labor 42% (42.1%), Greens 7% (6.6%) and Christian Democrats 4% (4.9%). The seat will be vacated with the retirement of its two-term Liberal member, Glenn Brookes. The sample for the East Hills poll was 508. • A somewhat different story in Ryde, where the poll picks an 8.5% swing to Labor – although this still leaves Liberal member Victor Dominello with a 53-47 lead. The primary votes are Liberal 43% (53.7% in 2016), Labor 36% (28.9%), Greens 10% (11.5%) and Christian Democrats 5% (4.2%). In this case the sample was 534. • The polls also inquired as to whether “the performance of the Scott Morrison-led federal government” made respondents more or less likely to vote Liberal. The result actually broke favourably for the Liberals in East Hills, at 35% for more likely, 31% for less likely and 28% for no influence, while the respective numbers in Ryde were 30%, 37% and 28%. A statewide YouGov Galaxy poll in late November had more likely at only 20%, less likely at 33%, and no influence at 35%. • On the question of most important election issue, East Hills respondents came out for migration/population on 33%, well ahead of health, urban development and infrastructure projects, while urban development led in Ryde on 27%, with migrant/population way back on 18%. This either says something profound about the political geography of Sydney, with great portent for the federal as well as the state election, or something mundane about the vagaries of polls with error margins of 4%. • The Liberals are said to be “marginally ahead” in The Entrance, which Labor holds on a margin of 0.4%, a fact reflected in regular visits of late from Gladys Berejiklian. Other Labor-held seats where the Liberals dare to dream reportedly include Granville (2.1%) and Port Stephens (4.7%). • The Nationals are said to be concerned about Upper Hunter (2.2%) and a brace of North Coast seats: Tweed (3.2%), Lismore (0.2% in Nationals-versus-Labor terms) and even Coffs Harbour (14.3%). Coffs Harbour is being vacated with the retirement of long-serving member Andrew Fraser, and the polling reportedly points to a 10% swing. Conversely, the Nationals appear optimistic that the Greens will not repeat their coup in 2015 of winning Ballina, or of finishing second again in Lismore, where the threat comes from Labor. • Another danger spot for the Nationals is the normally safe far western seat of Barwon, which is being vacated with the retirement of Kevin Humphries, and is reportedly under threat from Shooters Fishers and Farmers. • The report also suggests the YouGov Galaxy result from East Hills might not be far off the mark, with the Liberals believing demographic change is working in their favour there. However, they are apparently pessimistic about Coogee and concerned about Penrith, Goulburn and Bega. A small sample New South Wales poll adds to an overall picture of both major parties being so subdued on the primary vote as to make the final outcome anyone’s guess. The Guardian reported yesterday on a poll of state voting intention in New South Wales from Essential Research, with a small sample of 544. The poll had the primary votes at 39% for the Coalition, 36% for Labor, 10% for the Greens and 8% for One Nation, with Labor recording a 51-49 lead on two-party preferred. However, the latter figure, however it was derived, would have to be regarded as highly speculative, given the wild cards of One Nation’s preference flows and the rate of exhausted votes under optional preferential voting. I wouldn’t normally make a post out of a poll with such a small sample, but with an election five weeks away I’ll take what I can get. While I’m about it, I’ll take the opportunity to promote the Poll Bludger’s vast state election guide, to which a permanent link can be found on the sidebar. It features a poll trend measure to which the Essential result has just been added – to very little effect, since its results are very similar to what the trend was already been showing (and it was given a low weighting, reflecting the small sample). Introducing the Poll Bludger’s New South Wales election guide – including, together with much else, a poll trend measure pointing to a tight race. • A poll trend feature. The latter shows Labor with a 51.1-48.9 lead on two-party preferred, but that’s probably a mite generous to them, as the “others” pool looks to have swollen with defectors from the Coalition to One Nation. No primary vote trend measure for One Nation is available, but it’s telling that the Coalition is down 8.3% on the primary vote and Labor up only 1.7%. Needless to say, all this involved a fair bit of effort – if you think it worth rewarding, you are encouraged to give the PressPatron donation facility at the top of the page a workout, through which either one-off or monthly donations are always very greatly appreciated.